Every ounce of pride in being a Cowboys fan was dripping out of the dam as this season progressed. On Sunday, the Green Bay Packers opened up and burst through the floodgates. Embarrassed doesn’t even do it justice. The Cowboys were just downright awful on Sunday night on national television. 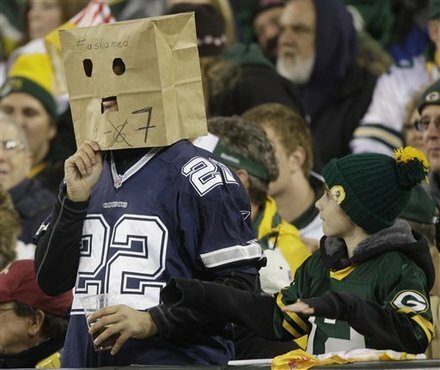 It is clear that any wind the Cowboys had left in the tank was vacated in last weeks loss to Jacksonville and a whole host of heartless bodies got off the plane in Wisconsin. The Cowboys played without heart, motivation, and any sense of pride. The game snowballed completely out of control right from the second quarter on. Amazingly the first quarter remained scoreless. Green Bay displayed early dominance as the Cowboys went three-and-out on their first possession then on their next possession Kitna under threw WR Miles Austin and was intercepted along the sideline. On the Packers first possession they moved the ball from their own 18 to the Dallas 36 before the Cowboys were able to block a 54-yard field goal from K Mason Crosby. After their interception of Kitna, Green Bay then went on an eight-play, 63-yard drive that ended with Rodgers hitting RB Brandon Jackson, who scampered in for a 9 yard score giving the Pack a 7-0 lead. The next two possessions for the Cowboys resulted in more of the same, three-and-outs, while Green Bay continued to score and look unstoppable. The Packers capitalized on a 7 play, 80-yard drive with Jackson scoring again, this time with a 2-yard run. Then they scored on a 93-yard drive, with Rodgers hitting WR Greg Jennings for a 8-yard touchdown. On the following kickoff, rookie Bryan McCann, called up from the practice squad, brought the ball out to the Dallas 25 and fumbled, although on replay he had a knee down before having the ball stripped from his hands, but, because the Cowboys had used their timeouts, they couldn’t challenge the play, and so when Packers’ cover man Nick Collins picked up the loose ball he ran into the end zone for a 28-0 lead. As seems to be the case this season, the only bright spot for the Cowboys is Dez Bryant. Kitna found the rookie wideout for a 41-yard completion down to the Packers’ 2. They finished the drive when Kitna lobbed the ball to Bryant who pulled it in for a touchdown cutting the Packers’ lead to 28-7 after two quarters. That is as close as the Cowboys would get the rest of the way. Cowboys fans were wondering when the game would end and they could be put out of their misery. The Packers showed no mercy. On their second possession of the third quarter, Rogers found James Jones for a 10-yard score. Then on their next drive, the Packers maintained possession for 9:13 before Mason Crosby kicked a 26-yard field goal, stretching the lead to 38-7. The final score came on the Cowboys’ next series, Kitna was actually leading another drive before his pass was deflected at the line of scrimmage and fell into the hands of Packers LB Clay Matthews, who returned it untouched for a 62 yard touchdown putting a final nail into the Cowboys proverbial coffin and making the score 45-7. Cowboys fans were thankful that the scoring stopped there. This game brings up a lot of questions for the Cowboys, none more popular than the immediate future of Wade Phillips. Clearly his plan of going back to the fundamentals was not the answer as the Cowboys didn’t even do those well. Cowboys owner/general manager Jerry Jones was seen shaking his head a lot during the game and I have to believe that he is close to pulling the trigger to fire Phillips. Another issue has to be the play of the Cowboys offense. I’m not sure how much longer they will play with Kitna at the helm. You have to think, second year man, Stephen McGee could benefit from the reps as the season is now over, if it wasn’t after last week’s pathetic performance. The whole team was lack-luster; the offense was horrible, the defense couldn’t stop anything, and the coaching staff is out of ideas. Time for a change in big D. At least they are still in the running for the first overall pick in next year’s draft. As for the Packers, it was a dominant performance that might help them build the momentum they need to take the next step in their season. They certainly performed like they were expected to at the beginning of the season. They will take this win and enjoy causing the Cowboys this misery.